Spring is the perfect time for a wedding because of the beautiful weather, the gorgeous freshly bloomed flowers, and the fun pastel colors. 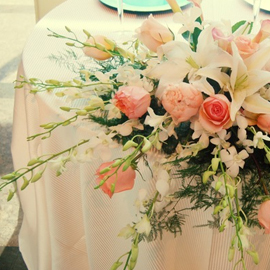 Here are some great wedding ideas that will get you thinking Spring! Spring and pastel colors go hand in hand and for all the right reasons! Spring is all about new, and shedding off the cold from winter. Choose a palette of milky blues, mint greens, and light lavenders to create a romantic and light feel for your wedding day. If you find the pastel palette too cliché, you can instead opt for more earthy and natural color themes. Spring is all about the new blooms and there are a lot of gorgeous flowers that are in season. You can also mix the flowers with other organic colors or wood and other greenery. Think rich and luscious, trust us it will look amazing. Spring weddings offer a lot of room for creativity when it comes to designing the centerpieces. You can do romantic white tulips in big vases, a quaint wooden basket filled with seasonal fruits, or bold floral arrangements with all the in season flowers and plants. Now is the time to fill the table with the greens, think outside the box, create a low and long tablescape for one table and a tall and fill centerpiece for another. We know the saying, “April Showers. . .” there is always a higher possibility of rain with a spring wedding but that doesn’t mean your big day will be ruined! Instead, just plan ahead and always have a backup plan. A great idea to prevent the weather from ruining the day is to have a indoor option. If you were hoping to have a beach wedding, One Atlantic is the indoor option to avoid the rain. Think of gorgeous lights, and other romantic décor while still enjoying the amazing view of the Atlantic City beach, skyline and Atlantic Ocean. Our expert staff will gladly help you plan a great outdoor theme wedding, inside! For a spring wedding, your favors can be fun, bright, and useful! Make mini bouquets of beautiful vibrant flowers, spring colored candies, or use adorable miniature picnic baskets and fill them with candies and other treats. For more ideas on planning a spring wedding, please refer to our next blog! We are a world class wedding and special event venue and our extensive staff is dedicated to giving you the best day or night of your life. To learn about our Atlantic City wedding packages, please give us a call today at (609) 343-9902!